It seems like every day, a new company announces its plan to get rid of the performance review. Rightfully so—according to CEB, a company of 10,000 employees spends an average of 200 manager hours and $35 million annually on this process, which yields little to no return. But before you go and throw away your company’s review process, be prepared with what you will implement instead. In order to create a high-performance culture, you will need a more holistic framework that is designed to allow employees to own their development, creating an impact on your company culture and bottom line. Incorporating the practices of continuous feedback and employee development resources are vital staples in creating a performance management process that will help engage and retain employees. In this webinar, Srinivas Krishnamurti, the CEO and co-founder of Zugata, a performance management software company, will walk through how to effectively establish these practices in your company culture. Organizational culture is a top leadership priority for organizations around the globe. As the system of values, beliefs, and behaviors that represent “the way things work around here,” culture is persistent in ways that individual leaders, strategies, and goals are not. Executives increasingly recognize that a proactive approach to culture is essential to both short term success and long term endurance – and they are looking to human resources to play an important role. Bersin’s* recent High-Impact HR research found that high performance organizations have HR teams that embrace their role as culture shapers, actively helping the organization to both preserve the best of what sets it apart and develop values such as trust, empowerment & experimentation, and inclusion. *As used in this document, “Deloitte” means Deloitte Consulting LLP, a subsidiary of Deloitte LLP. Please see www.deloitte.com/us/about for a detailed description of our legal structure. Certain services may not be available to attest clients under the rules and regulations of public accounting. Traditional annual performance reviews are limited by their ability to accurately capture and improve an employee’s performance. The time and effort to execute reviews versus the value they produce leaves much to be desired, and more companies are starting to search for a better process that aligns with their high-performing cultures. As the HR industry recalibrates its approach to performance management, many are left wondering: what would it look like to implement another method of performance management? Amy Dobler, the former Director of Employee Success at Jive, asked this question when she chose to re-evaluate Jive’s review process. In order to understand what method would engage employees and provide useful data on their performance, she reached out to Jive’s employees and stakeholders for input to create a more strategic process. In this webinar, Amy will elaborate on how their team implemented a people-centric approach to performance management that created a culture of coaching, feedback, and growth. 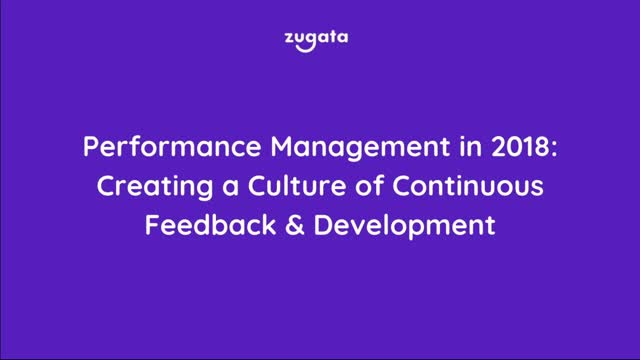 Zugata is Performance Management Software for high-performance cultures. It is the only solution that enables both performance evaluation and performance development, driving performance forward and impacting your company’s bottom line. Our robust platform accelerates employee performance by using sophisticated algorithms to gather continuous feedback, enabling meaningful check-in conversations, and delivering personalized resources to help employees advance their skills.